Three people have been charged with murdering 16-year-old Ben Kinsella who was stabbed to death in north London. The teenager had been at a bar in Holloway when a disturbance broke out and he was stabbed later in North Road. Ben, who had just finished his GSCEs, was the 17th teenager to be killed in London since the start of the year. Juress Kika and Michael Alleyne, both 18, and Jade Braithwaite, 19, all from Islington will appear at Highbury Corner Magistrates' Court on Friday. An 18-year-old man arrested on Monday at an address in Islington has been bailed to return to a London police station in mid-August. Two 16-year-old youths arrested at the scene following the incident have been released without charge. Following his death, hundreds of young people marched through the streets of north London to protest against knife and gun crime among young people. On Monday his sister, former Eastenders actress Brooke Kinsella, appealed for witnesses to come forward and help the police. 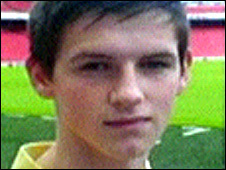 A website and fund has been set up by the Kinsella family in memory of the teenager.